Ashley and Pardew want to aim high next season … within reason | NUFC Blog. Newcastle United manager Alan Pardew meets with owner Mike Ashley to discuss the club’s aims for the 2011/2012 season. “Now it’s about recruitment and making sure the squads stronger. It’s quite obvious at this time we can’t compete with the likes of Liverpool, Tottenham and the top four. “We could attract a squad here I know would keep us safe in this division but that’s not what Mike wants and it’s not what I want. We want to try and excel. We have to try and take a few chances with players that will keep us in the division but who might take us on to that next level. From what Pardew has said there, I assume that means Ashley and him feel that a top 6 finish might be beyond us at the moment but, with some shrewd recruitment, 7th or 8th might be within our grasp. Given that, as the table stands today, just 3 points separate us from 8th place and 6 points separate us from 7th, those positions look like a feasible aim with the right squad improvements. Yet we still need to temper our ambitions a bit. Many feel that we’ll have ‘second season syndrome’ to cope with in 2011/2012 and of course when we strengthen our squad it’s reasonable to assume the our main competitors for those positions – such as Stoke, Bolton, Fulham, Everton and Villa – will also be improving their own squads. A lot depends on how our scouting network – and Pardew, assuming he has the final say – perform in terms of finding suitable transfer targets, and also how Pardew’s tactical nous holds up next season. It seems Enrique is waiting to see which clubs try to tempt him away from Newcastle and I suspect a new left-back will be a priority signing over the summer. I would describe Pardew’s assessment of his meeting with Ashley as moderately encouraging, although it’s just words at the moment and we’ll have to see where we actually are come August. He can spend the 35 million from the Carroll sale and we will still be in a better financial position than we were this time last year so Ashley should realise that this is progress in his balance books and release the full 35 million! If he does this we can get the vital forward threat we’ve been lacking I would be confident of pushing 6th place given what we’ve done this season. I would definitely enquire about Sturridge for starters! Just come off the Chronicle blog and the chatter is of unearthing the likes of Beardsly, Waddle and Gascoign Etc,to bring back a little pazzaz to The Cathedral on the Hill. Whining ong on about having to but these sorts from champions league outfits is just crap for me. If my memory serves me right, i,m sure Tow Law wer,nt in the C/L when we signed Chrissy and i,m pretty convinced that Carlisle,s cv does,nt show any record of C/L when we got Peter. Not sure if Gazza ever played for Blakelaw Club either but you get the gyst of my copy. They say that the days of whistling down a pitshaft and up pops a goalscoring lagend days are no more, but I,m not convinced. Having been involved in th NE Sunday League for a good number of years, Iv,e seen some cracking players who would make the grade if coached in the correct manner. That was many years ago, and I know that the standards have changed and the quality required is perhaps greater, butits the raw tallent that makes a superhero. Just remember that the likes of the aforementioned would have got into any team in Europe in their day and did. The truth is out there. Keep your eyes open. The chances are that the club have been watching them for some time already, but you never know. Don,t be afraid to tell someone if you happen across a talented player. A trial costs only a bus ticket. !!!!!! HWTL. This summer will be the most exciting and important transfer windows for us in recent years. With Pardew, Carr and especially Ashley I can expect the unexpectable activity for it. If possible we should move it as soon as possible and get someone before pre-season start. Hopefully we’ll stronger and ready for next season. what worries me are the quotes what you have not printed, the bits where it says………one or two may go. One is jose for defo, i wonder who the others are? It would appear that the club have their act together about who they want, why and how much they cost and how much the club has to spend. I suspect the players they have in mind are young (21-23) who are on the fringe or can’t always get a game every week and who want the opportunity to show that they can compete in the premiership. I think we may see some foreigners (perhaps French) and some home grown players arrive. I think the forward line and wingers are the priority. With the exception of the Enrique situation we don’t need any more defenders. It will be interesting see whether they try and get a Carroll like replacement or whether they change the style and tactics of the team to play to the strengths of more exciting players who can turn a game like Ben Arfa and the likes of Taarabt and Sturidge. It’s not the amount of money the club spends. It is the quality of players they buy. The best example this season is Javier Hernandez of ManU who only cost £7 millionish. Is Carroll at £35m five times better than Hernandez? Nope. For that read Tiote and Enrique. For them 1-2 players read the full first team and the players we really want to sign are all from the championship as that is where the fat one likes to be as the pies are nicer. Enrique might go but come on lads, tiote has said he is settled and wont move to London but all of a sudden he’s going to move to tottenham? I suspect those 1-2 players will be fringe players who want regular first team football, and fair play to them. now pardew is saying joey is basically leaving as the deal is not right and that they have offered the deal and he either takes it of goes. so there is two, barton and enrique. With jonas saying just this week that it is vital the jose stays in order for him to enjoy being at our club from a ‘off field perspective more than on field’ also indicates he will leave. sotoo will colo. So thats four big boys out the door. i hope we get in some top draw replacements or we are gonna be in a very very bad predicament next season. There’s no point in jumping to conclusions about transfer ruours before the window opens. Having said that “It’s quite obvious at this time we can’t compete with the likes of Liverpool, Tottenham and the top four” why is it obvious we cant compete with Liverpool ? 11….. bang on andy mac. i will take a bet with anyone right now that we start next season with a weakened squad and more money recouped than spent. and really, i am not jumping to conclusions either, i am merely saying exact quotes from the team and pardew. Its so obvious that it stuns me that some people dont grasp it. Our best players are very good… barton, jose etc. they have ambition and drive and they feel that nufc is a club that while clearly balancing the business side very well… have zero on field ambition. and its just out of sheer stubborness that ashely does it, its not based on money. look at barton.. he wants another year more on his contract and has offered an olive branch in saying he will even take a pay cut to stay on right length deal. So today pards says the deal is on the table, take it or sod off. The daft thing is though, barton is only 28 and his is the driving force in our entire team. he plays well, we play well. he is committed and passionate and he is already paid for and at our club. Why let him go for reduced rate cos even if you give him a long contract we can still sell him, it means nothing.. look at carroll. If we gave barton another 1 year ontop.. thats around 2.5 million extra for that year….ffs… ashley just last month lost 1.2 million on a craps table and tipped the lass 700 quid for it too. Joker!! CC – I agree entirely with what you are saying about JB, surely thats obvious even to the baffoon. I just dont agree with your opinion that we will start next season with a weeker squad. That makes no sense either. Please explain to this thick Geordie, WHY? Cus I just dont get it. Plus if the club have said take it or leave it to JB then surely he can just stay for his last season and walk for free. I’m sure fat ash wont see any value in that either. They cant force the player to make a move either, although I am sure that if a good enough offer comes in then JB will take it. Ginkoh, You could “expect the unexpectable” with Newcastle United long before Ashley came on the scene, though he’s certainly keeping up the tradition! BB @ 13 and 14…..
the reason i think we iwll be weaker is because obviously jose is going to leave so that is a seriously high quality lb gone.. prob in top three in the prem. i have no idea who we will bring in to replace him but i find it hard to believe he wil lbe better, have the same affinity with fans and more importantly, link up with jonas down that left flank. Moving onto jonas, he has said that he needs jose to stay in order for him to be happy, he evne said it was vital… so that will clearly have a knock on effect when jose goes. Jonas has nt just came out nad said that quote for no reason. Spiderman wil lleave if jose does. We then have to link in colo with jose, they are best mates, from same country etc…these three ddues are tight. Ashley needs to think very carefully as there will be massive knock on effects and huge consequences. Then we move onto Barton… our talisman and engine room…he is either going to be sold or he will stay for another season and leave for free, either way its a crap situation. He goes, compunded with jose and the other two at least being really unhappy, or at worst leaving… then its not a healthy camp. These guys are our entire tema nearly in terms of backbone and they are our very heartbeat..barton,jose, jonas, colo, nolan. its all hanging by a thread purly cos ashley refuses to give an inch and is a stubborn fat knacker who ahtesto be dicated to, even to the point of just giving barton the deal he wants. Ashleys ego is a saerious issue as is his constant gambling with our squad morale and stability. Fergie when asked this week what was the secret.. he said stability breeeds sustained success..; its that simple BB. These are my reasons and thoughts for what i said, right or wrong, i stand by them. cc – thanks for yor reply which i respect. It would be easy for me to agree with you and join your bandwagon, as it is all quite plausible. A lot of the doom and gloom scenario that you paint tho, seems to hinge on whether or not Jose goes. Is it right that one player can be so influential? Well clearly it is. You and many others now seem convinced Jose is going, and I have to admit the writing is on the wall. But a little part of me hopes that he will stay, and that the club will do the right thing re Barton, Nolan etc. This club of ours is on the brink of being great again, and to throw that all away beggars belief. 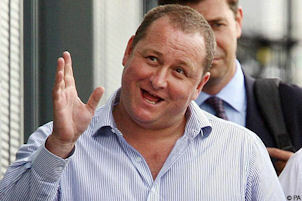 I guess I’m guilty of being deluded that Ashley will see sense and do the right thing, despite all the previous debacle. I know any normal person would, and thats the rub. Incidently whats the odds on Jose submitting a transfer req after the match today?